Turtles are cold-blooded, meaning they can’t regulate their own body temperature. They rely on the sun for warmth. So what happens in the winter when it’s cold and dark for months on end? Turtles have a few clever strategies for surviving. They don’t go into complete hibernation, but they do slow down. As winter approaches, aquatic turtles settle on the bottoms of ponds and lakes. Sometimes they dig into the mud, partially covering themselves. At other times, they just rest on the pond floor. As temperatures drop, the turtles’ heartbeats and breathing slow down. They seem like they’re in a deep sleep. Researchers have found, though, that these turtles are paying attention to their surroundings. As soon as the water starts to warm or the turtles see light, they begin to move. They’re ready for spring. Scientists have observed turtles swimming under the ice on mild winter days. Box turtles burrow into the soil or hide in rotting logs or under leaves. They, too, go into a state of partial hibernation. Their heartrates and breathing slow and they eat little food. Red-eared sliders burrow under the mud found in pond bottoms. They absorb oxygen through their skin. Question: Should I feed turtles during the winter? Answer: Chances are, you probably won’t see a wild turtle during the winter to feed it. The main challenge turtles face is a loss of habitat. When wetlands, ponds, and forests are destroyed, turtles have no place to go – and they’re more likely to freeze during cold weather. Watch a video about eastern box turtles. Declan, Tobin. " Do Turtles Hibernate? ." Easy Science for Kids, Apr 2019. Web. 25 Apr 2019. < https://easyscienceforkids.com/turtles/ >. 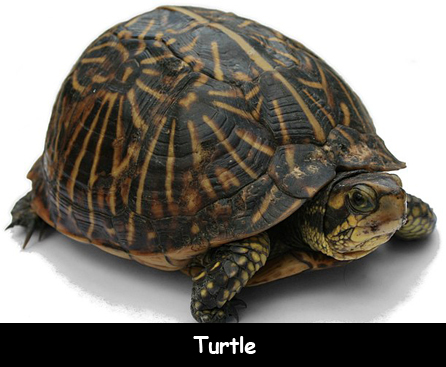 Turtles - How They Differ From Tortoises?